How to Easily Attain Astounding Success in Every Aspect of Your Financial, Physical, and Social Life By Unleashing the Hidden Power of Universal Laws! Hidden behind our existence are the most potent laws that govern us all - the laws of the universe. Would you like to know more about the universal laws that everybody, whether consciously or unconsciously, adheres to? Do you realize that learning more about them and applying them to your daily life can take you to a much higher level of attainment in all aspects of your life? "Learn how to use the hidden powers of the universal laws today!" The universal laws of man are real. These laws are the unlisted, unstated, and underestimated laws that govern humankind. "These laws are always right!" All people, regardless of their race, age, gender, or nationality instinctively follow them, whether or not they knew these laws existed at all. What if you knew exactly what these laws are and how they work? "The universe possesses the incredible power to give you anything you want!" Your can be rich, famous, well loved, and very satisfied in life! With the power of universal laws lying in your hands, you have the ability to alter your mindset and mold your thoughts and emotions to bring you the very thing you desire! Be one of the lucky people who have come to realize the tremendous powers of these laws in fully improving the lives of many. See how these laws have brought forth prosperity, contentment, happiness, and freedom to those who knew how to apply them properly. These laws embody utmost control! You use them right and the benefit goes directly to you. You misuse or abuse them and the consequences will reverberate right back at you. It is then important that you know how to utilize these laws correctly. Studying and understanding them deeply is the key to make them work for you. You might have heard of these laws all along, but you have never really understood their importance nor power. These laws are the very factors that can give you financial freedom, fame, and supreme happiness in life, if used appropriately! Once you know how to apply these laws correctly, you are on your way to living an entirely different life - a life that is full of greatness and fulfillment! In this regard, a special report was created to help you discover the power and mysteries behind the universal laws and how to apply them in your daily living for maximum positive results. It is entitled The Hidden Power of Universal Laws. This report reveals a foolproof blueprint on how you can unleash the hidden power of the universal laws to realize all your goals and attain unparalleled success! Take your understanding of life into the next level. Master these laws and make them work for you. 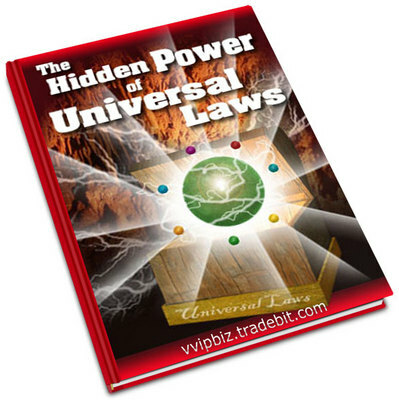 With The Hidden Power of Universal Laws, all the concepts associated with these laws are exposed, explained, and made simple for readers to comprehend. You can make these laws as tools to advance your way towards the life that you really wanted for yourself and your family. "Get The Hidden Power of Universal Laws today!" Feel what it is like to have the world revolving around you. Wake up each day feeling well rested and ready to take on life's challenges easily. Get rid of your depression, anxiety, insecurities, and fears. Make the world go out of its way to please you, and not the other way around! "Start seeing life differently! Achieve your aspirations and vision!" See how these laws can transform the way you think. Watch these laws in action and be convinced that they affect everyone. Realize that with these laws behind you, you have the ability to conquer anything and be triumphant in everything that you do! Know exactly how to fully enhance your life. Change the way you see life. Make the universal laws work for you to give you your every heart's desire. Realize all your dreams and make them come true today! P.S. Do you think you have done everything but you still can't seem to make things going for you? Abide by the universal laws and see the big difference! P.P.S. The universal laws are just there waiting to be used. Exploit them today and experience the power!